Preservationists have been holding their breath about Saarinen's TWA Terminal at Kennedy Airport, dormant since 2001, ever since JetBlue announced they were building their own terminal really, really close to it. Without doing anything to it. The New York Times reports that the Port Authority is soliciting development proposals for the building. 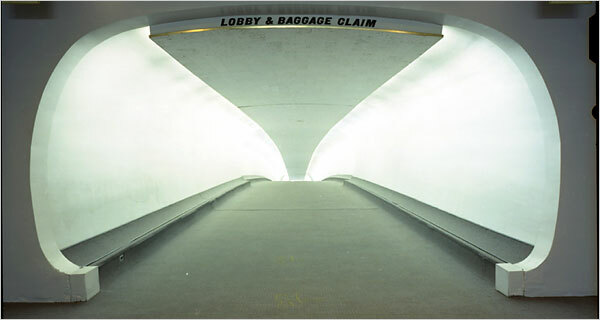 The high notes: Saarinen's original design and details will be restored and preserved, and you can still walk through the space ship tubes to get to the Jet Blue terminal. The low notes: what, really, does one do at an empty terminal building in the middle of an airport forever clogged with traffic? And, as Frank Sanches of the Municipal Arts Society aptly points out, how will such a huge restoration project make this an attractive development? Questions abound. Preservationists (and Saarinen lovers, like myself) can breath out, and breath in. And hold the breath a little longer.